The Harvard Club of Savannah and Coastal Georgia’s purpose is the enhancement of the intellectual, cultural, social, and philanthropic lives of club alumni via continued learning and connectivity with other Harvard alumni locally, regionally, and internationally. Founded in 2010, we welcome you to join us, help us to grow, and take part in fellowship and club activities. We focus on bringing the best Harvard offers to a city and region that have significant history affecting this nation. We are the only club in the Southeast to have both the Harvard Glee Club and Harvard Choir perform in the same city, Savannah, as well as hosting the Opportunes, Harvard’s oldest mixed acapella group. Our Schools and Scholarship Committee performs one of the most important club functions. In the fall 2017 to the first months of 2018, we interviewed 46 students, the most in our 8-year history. Fortunately, with U.S. and international annual applications of over 40,000 for freshman classes of just over 1900, we succeeded in having 8 applicants receive offers and 6 acceptances over those years. It is so important to encourage art in all forms as a fabric of our community and the nation. Club members have attended numerous art exhibit receptions to support local galleries. Members receive notices in advance of upcoming events. Please visit the Past Events pages to see the rich mixture of inquiry, engagement, and downright fun. Savannah is indeed a magical destination. According to the Rolling Stones, Boston to Savannah is “just a shout away”. 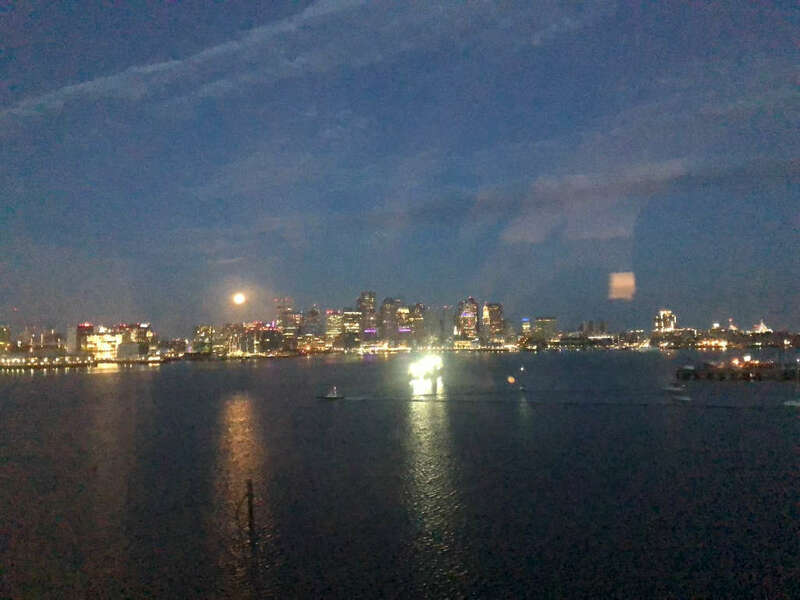 Victor Petralia, Co-Chair of our Schools and Scholarships Committee, photographed this view of the moon setting over the Boston harbor, Sunday morning 26 August 2018, as he headed back to Savannah.